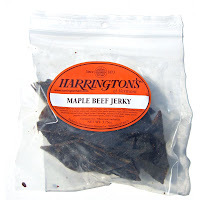 Next up in the series on Harrington's of Vermont, is this Maple Beef Jerky variety. See my previous review of their Original Beef Jerky. Harrington's of Vermont is a brand of Harrington's of Vermont, Inc., based out of Richmond, VT. The brand has been around since 1873, known mostly for its hams and smoked meats. They also offer cheeses, syrups, and desserts. Their beef jerky appears to have been manufactured by Rosie's Vermont Beef Jerky. I've never had Rosie's, so I can't say if this actually tastes the same. I don't know if Harrington's is private labeled from Rosie's, or if Rosie's is making a unique recipe for Harrington's. Beef, soy sauce, worcestershire sauce, maple syrup, flavorings, seasoned salt (salt, sugar, spices, paprika, dehydrated garlic, yellow 6 lake), spice. The first thing I taste from the surface of these pieces is a worcestershire sauce flavor, with a light sweet, and moderate saltiness. The chewing flavor is largely more of the same, maybe a slightly more defined worcestershire sauce flavor. For being dubbed a "Maple Beef Jerky", I don't taste any maple flavor. Even though the ingredients lists Maple Syrup, I don't recognize anything that tastes like it. I do taste some sweetness, but it doesn't come off with a resounding maple flavor. Otherwise the flavor I taste the most is the worcestershire sauce. 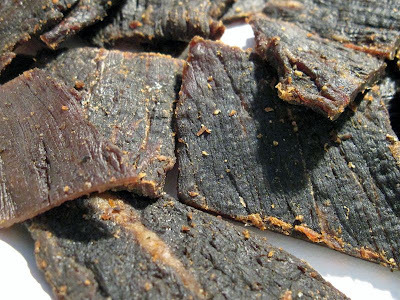 In fact, this jerky is largely like Harrington's Original variety I reviewed earlier, except with with a well-noticed sweetness. There's a soy sauce flavor also, but it doesn't make itself known until the latter part of chewing, once the sweetness starts to wear off. The saltiness seems to be at a moderate level, not too high, not too low. I don't really get any natural meat flavor, but I do taste a light fatty flavor due to some visible streaks of fat in a few pieces. There's also maybe a smidgeon of garlic noticeable in the initial chewing. Overall, what you're going to taste in this jerky is a dominant worcestershire sauce flavor, with a sweetness, but nothing that resembles maple syrup. You'll taste some soy sauce in the latter part of chewing, and that's largely it. 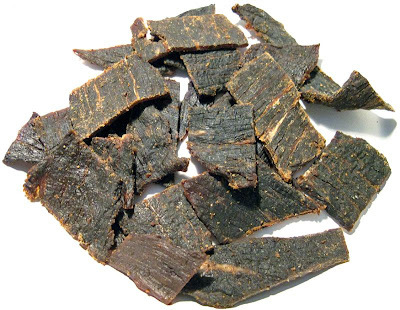 This is a dry jerky, some of which have a dry surface feel, others with a semi-moist feel. Tearing pieces apart with my fingers seems easy to do, while chewing ranges from easy to somewhat chewy. The chewing texture starts out feeling stiff and woody, with a fair amount of chewing resistance. It softens up with a fair amount of chewing and chews down to a soft mass in about 15 seconds. At that point it takes on a steak-like chewing texture, kinda dry like a well-done cooked steak. A few pieces have some visible streaks of fat, otherwise I don't see any gristle or tendon. For the most part, I didn't encounter any stringy sinews, but some pieces left behind some unchewable wads of tissue. But it's seems to be pretty clean eating, I didn't get any residue on my fingertips, and found no tiny fragments of meat on my lap or desk. Harrington's of Vermont sells this Maple variety of beef jerky from its website at a price of $29.95 for 15oz (four bags of 3.75oz each). Add to that shipping costs of $13.99, and the total comes to $43.94. That works out to a price of $2.93 per ounce. For general jerky snacking purposes, at the $2.93 price per ounce, this jerky seems to provide a weak value. I don't really feel all that inspired to keep eating this, though the addition of the maple syrup sweetness seems to round out the flavor better than the Original variety. Still, the $2.93 price per ounce is very high compared to the mass-market brands found at the grocery store, and I think you'll get just as much snackability from those as well. As a Maple variety of beef jerky, at the same $2.93 price per ounce, it's a weak value again. I don't really taste any maple syrup flavor, only a well-noticed sweetness. Considering how high that price is, I had expected more. This Maple Beef Jerky from Harrington's of Vermont fell short of my expectations because it didn't give me a clearly distinguishabled maple syrup flavor. All I taste is some sweetness. Aside from that, it's largely the same jerky as their Original variety. I had hoped for that same goodness I get when maple syrup runs off my stack of pancakes and floods over my bacon. You get that salty smoky bacon flavor mixed with that thick sweet maple flavor. I had hoped to taste that on beef jerky with this, but alas, no. On it's own merits, it's still a decent jerky, but doesn't provide enough snackability to keep me reaching for more. It's mostly a worcestershire flavor than anything else, and I've tasted lots of worcestershire marinated jerky. Even though it's fairly easy to eat and chew, it chews quite dry. My recommended beer pairing for this would be a smoky porter.